Dale Carnegie Training honors ..
MTSU is new national model for..
MTSU students, faculty, staff, and alumni have served our country with great distinction all over the globe. MTSU alumni also have been awarded honors as high as the Navy Cross and Distinguished Service Cross and have served in historic units such as the famed Black Sheep Squadron of WWII, the Marine Raider Battalions, the Eighth Air Force, the 101st Airborne’s Screaming Eagles, the 1st Air Cavalry, and many others. An MTSU grad and WWII pilot even named his P-38 Lightning aircraft the Blue Raider (funny, isn’t it, that the aircraft type’s nickname was Lightning, which eventually became the name of our University’s winged-horse mascot?). This tradition of service to the campus, community, and country began shortly after the University opened in 1911. In its more than 106 years of operation, MTSU has had thousands of students serve in the military. At least 68 of these service members have made the ultimate sacrifice. One of the first MTSU alumni to fall in the line of duty was William J. McConnell, author of the original MTSU alma mater. In spring 2003, MTSU lost two alumni in the War on Terror, Lt. Pierre Piche and Lt. Ken Ballard. As MTSU mourned these two young men, the campus community also sought ways to commemorate them as well as the other MTSU alums like them who had served our country. The institution’s rich traditions of service were well-known to those who had attended MTSU over the past century; however, memorials to those who had served were small in scale and scattered throughout the campus. By 2004, a movement to create a new, more ambitious consolidated Veterans Memorial began. The result of this grassroots effort—led by faculty, staff, alumni, and students with a passion for honoring these veterans—was the 2009 completion of the MTSU Veterans Memorial, a special tribute to the MTSU spirit of service. The MTSU Veterans Memorial recognizes the contributions of those who have served in our nation’s armed forces since 1911. It is located within MTSU’s historic core near Kirksey Old Main, the Tom H. Jackson Building (the original cafeteria), and Rutledge Hall. The memorial also hosts a variety of events to continue honoring veterans and future military leaders. The MTSU Army ROTC uses the location, weather-permitting, for commissioning new officers in a special ceremony that links the past, present, and future. During the football season, the memorial kicks off the Salute to Veterans and Armed Forces celebration with a special remembrance ceremony, and on 9/11 members of the MTSU community gather there to pay respects to those who have made the ultimate sacrifice in the Global War on Terrorism. The MTSU Veterans Memorial continues to evolve as a significant part of MTSU’s cultural landscape. It serves as a focal point for everyone in the MTSU community to contemplate and commemorate the responsibility of service that comes with the privilege of pursing higher education. Suffice it to say, the volunteer spirit is tangible at the Veterans Memorial, too. It’s not uncommon to witness new students stopping at the site as they walk to and from classes to discover what it is and soak in its meaning. Many of us veterans who work at MTSU now view it as hallowed ground and our favorite spot on campus. But as Hilary Miller, director of the Charlie and Hazel Daniels Veterans and Military Family Center, is quick to point out, the site serves as more than a war memorial. “This is about our students,” she likes to say. Three granite walls resembling an open book to honor our academic roots compose the memorial’s central feature. 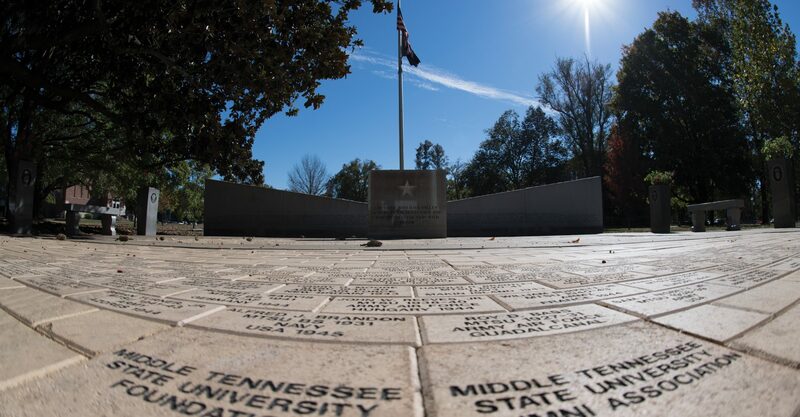 The center stone reads, “To those who have fallen who were students first and served their country with honor.” The two walls flanking the center stone have the names of MTSU’s fallen along with the location and date of death engraved on the north side. On the reverse side, a constellation of stars continues the tradition of placing gold stars for each of the fallen. Also, the words every service member recognizes from their enlistment oath, “To support and defend the Constitution,” reinforces the legacy of service to our country. In front of the memorial is a small plaza with spaces for anyone to honor a veteran by reserving an engraved brick. The MTSU Alumni Association also has set aside a space to have a brick honoring each of the fallen MTSU alumni in the plaza. The University seal sits atop the plaza near the Jackson Building. Behind the memorial’s walls, a flagpole with illumination permits an American flag and a MIA/POW flag to wave over this sacred space at all times. Arranged around the flagpole are trees, and markers are dedicated annually to a specific group of MTSU veterans. Military culture is written into MTSU’s DNA. Murfreesboro was built via the Revolutionary War land grants, and when Middle Tennessee State Normal School was established in 1911, battle damage from the Civil War was still visible on local buildings. The area around the University was used for drilling and training during World War I. During World War II, school president Q.M. Smith helped the institution recover from the Great Depression by securing valuable training contracts with the military industry. The college’s pilot-training program evolved into its Aerospace program, one of the best in the country. Thanks to Smith’s leadership and these war programs, the school began to take on a new identity. The government funding really boosted its reputation as well as its bottom line. And when the war was over, the people who had worked and trained at MTSU used their GI Bill benefits, and many of them came back to campus. Since 1911, Middle Tennessee State University students, faculty, staff, and alumni have served our country with distinction. Members of MTSU’s extended family have joined the military to serve and protect our country, to aid others in crisis, and to spread democracy around the world. For a $150 contribution, you can honor a veteran or active-duty service member who is important in your life while supporting the overall MTSU effort to remember all veterans who have demonstrated the Blue Raider spirit of service to campus, community, and country.